It was the middle of a hot July, and Tom Reiss was in the process of moving across the state of Michigan to resettle his home closer to the lake. When the hired moving company unloaded his collection of fine antique furniture and heirlooms from their truck, Tom was astonished by the way his pieces were packed and the manner in which they were being handled and unloaded. “There was an indication that something was wrong when I found a mover standing on top of one of our antique chests while unloading other pieces from the truck. It was all downhill from there,” Tom told us. Tom’s collection was composed of a wide variety of antiques that he and his wife had carefully collected over a span of 50 years. Tom credited his wife for the variety and quality of their pieces. “My wife is a decorator and she knows exactly what she wants, where to put it, and where it will look good. I don’t consider us ‘collectors’ - we’re just people who appreciate fine furniture,” Tom explained. Ranging from tables and chests to chairs and desks, the Reiss’s collection and the damage it sustained was truly varied. “To have our things in such deplorable shape was devastating and crushing,” Tom told us. After receiving a call from Tom’s insurance carrier, The Center’s team traveled quickly to Michigan to survey the damage. 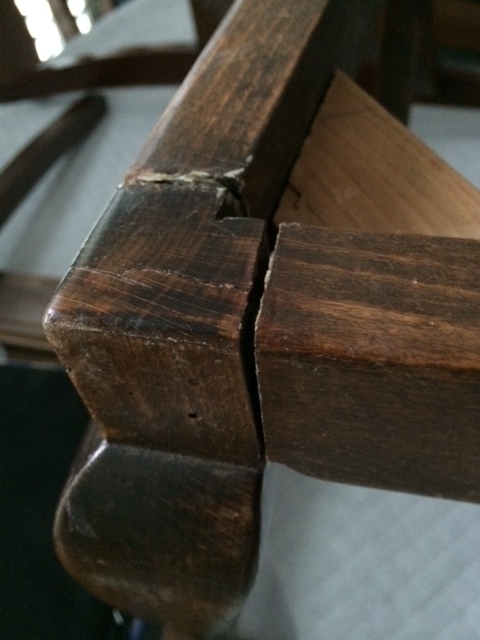 "Upon arrival, our team noted that damage varied from minor scratches and dents to fractured and splitting wood," said Steve Ryan, our Senior Furniture Conservator. "Moving damage can occur not only in transit, but also during the loading and unloading of pieces. 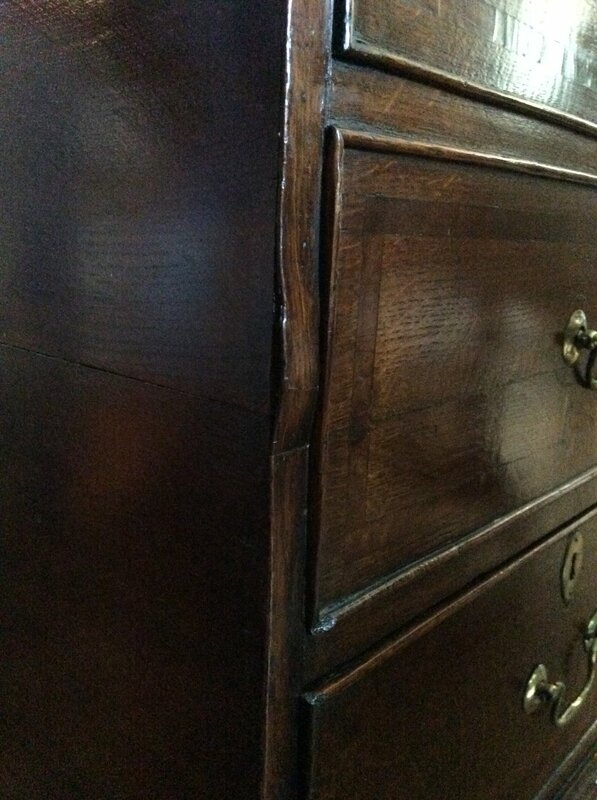 In addition to elements being loose or completely detached, furniture that has incurred moving damage can also exhibit scratches, gouges, chips, and scuff marks of all sizes and depths. Joints and veneers can become loose and corners can be crushed - all of these conditions were evident in Tom's collection." Moving quickly, our Shipping Department worked with Steve to carefully wrap each piece. The pieces were then loaded onto The Center’s truck and transported to our laboratory for examination and treatment. When fine and antique furniture is transported, if the pieces are not packed and handled correctly, oftentimes issues that are preexisting can be activated. Fragile elements and loose joints are more likely to detach from shock and movement when transported in vehicles that are not air ride equipped and temperature controlled. When possible, pieces should lie on their backs as opposed to standing upright. Carefully wrapping the corners of pieces is also important, as when movers are maneuvering larger pieces, corners are more likely to bump walls or snag corners. “Your team took the time and the care to wrap each piece to prevent further damage,” Tom said when we asked him about the initial onsite visit and pack out. Paul Kirk, The Center’s Director of Transportation and Installation, was one of our first team members to arrive onsite and begin packing the pieces for transit. “Pieces were individually wrapped, loaded, and secured onto our climate controlled, air ride truck, which is the preferred method for transporting antique wood furniture of this nature, since fluctuating outside temperatures can affect the works,” shared Paul. Once the pieces arrived safely at The Center, our conservators began photographing and examining them right away. Every scratch, gouge, and loss were noted in detail alongside our recommended treatment for repair. A report was then sent through for Tom and his insurance carrier to review and approve. Within the collection was a writing desk that exhibited veneer chips and losses, as well as four notable gouges. The desk separated into two pieces, and the top drawer would not close properly due to shrinkage from extreme temperature fluctuations. To begin, our Furniture Department surface cleaned the piece using the appropriate methods for the wooden desk. Next, we replaced the missing veneer and then seated loose or lifting sections of veneer with a conservation adhesive. Finally, areas of local scratches and damage were blended into the surrounding areas and repaired areas were toned to match. As the pieces were completed, Paul and The Center's Shipping Department delivered them to Tom in phases so he and his wife could have their furniture back for the holidays. “Tom directed the team in terms of placement of furniture in his house, and was very pleased with the quality of work and the safe arrival of his items,” Paul remembered. Although being faced with such situations can be very emotional and difficult, throughout the entire process Tom remained a pleasure to work with. We were glad to hear he shared the same sentiment towards us, and look forward to continuing to help Tom and other clients in the future.